If you haven't seen an eye on a piece of clothing, print, or accessory you may've had your eyes wide shut. They're on bags, dresses, jumpers and even shoes. 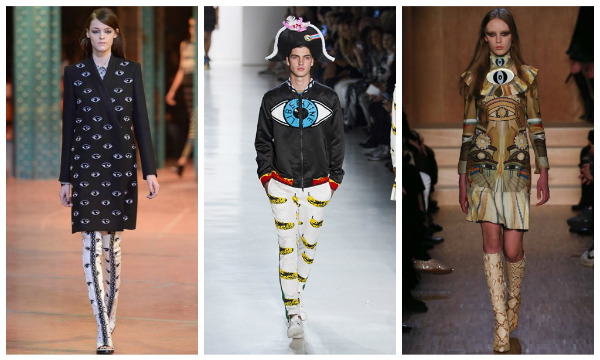 This post explores how the eye has been popularised on the catwalk as a motif, their symbolism throughout history and how indie designers and makers are embracing the eye and adding it to their collections. So where has the eye motif suddenly sprung from? In short, it hasn't. The eye isn't a new symbol. The earliest version dates right back to 3,000 BC! Back in Ancient Egypt there was the Eye of Horus, in Christianity there is the Eye of Providence which appears on the back of the US one dollar bill and, in lots of cultures amulets like the Hamsa protecting against the Evil Eye are as popular today as they've ever been. Many cultures believe the Evil Eye is a curse given to one by another to cause them misfortune and that the way to protect oneself is by wearing eye talismans, also known as evil eyes. Gigi Habid sees evil eyes as a way of 'protecting [yourself] from bad energy' enabling you, the wearer, to walk confidently with your head held high because you are repelling any negativity coming your way. Until now I've found the thought of wearing eyes a bit creepy, but viewing them though the same lens as Gigi, I can see them as an empowering symbol and one I'm coming round to. The popularity of the eye in fashion and accessories more recently seems to have stemmed from the catwalk. Kenzo sent eyes down the runway in 2013, creating sharp silhouettes featuring high contrast repeat prints for tailored jackets and trousers in black and white. Leather biker jackets and matching skirts in the same repeat print followed and the eye also featured as a stand alone motif on jumpers and t-shirts and so much more. These latter pieces have become a permanent part of their ready to wear collection and are available online. In the fall of 2016 Givenchy offered us a mash up of the Evil Eye and the Eye of Horus to create a range of futuristic looks rooted in the past, including the leather appliqué 60s style shift dress with turtleneck and ruffled collar above. While the eyes in this piece come from different cultures and times in history, both symbolise protection. To me this marriage of motifs suggests a message of unity; by looking to the past and embracing our differences we can move forward together into a more positive future. Most recently, Libertine in Spring 2018 opened our eyes to the more fun side of protecting ourselves from bad energy. Their show featured super sparkly jumpers and bomber jackets adorned with colourful appliqué and sequinned eyes. True to their psychedelic roots, they paired them with repeat prints of bananas and stripes to create pop-art influenced streetwear for men and women that not only act as protection from the elements but also offers a sense of humour, giving us a playful approach to tackling negative vibes. Trends take time to filter down to embroidery but I've been seeing eyes pop up all over the place on the indie needlework scene for a little while now and so I thought I'd share my favourites with you and see what you think of this trend. Will it be finders keepers for these peepers or will you be turning a blind eye? 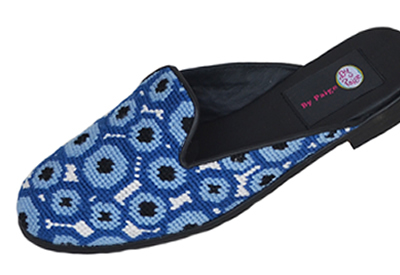 Let's kick off with these bold needlepoint mules By Paige. This gorgeous pair would certainly turn even the plainest of outfits into a conversation starter. They feature a vibrant repeat pattern of the blue Evil Eye talisman often seen in Turkey and are lined with soft kid leather for comfort. These look like the kind of shoes you could live in and once on would never want to take off! 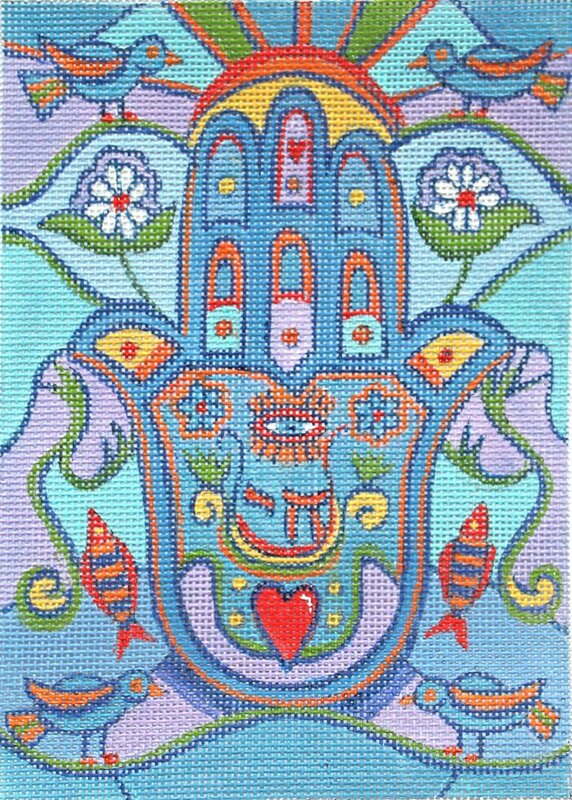 If you'd like to stitch your own eye this bright and cheerful Hamsa needlepoint canvas by Marcia Steinbock for Julie Mar is available over at Needlepoint For Fun. The Hamsa is an amulet popular throughout the Middle East and North America that symbolises power and protection, shielding us from unfavourable others and even our own gloomier inner thoughts. 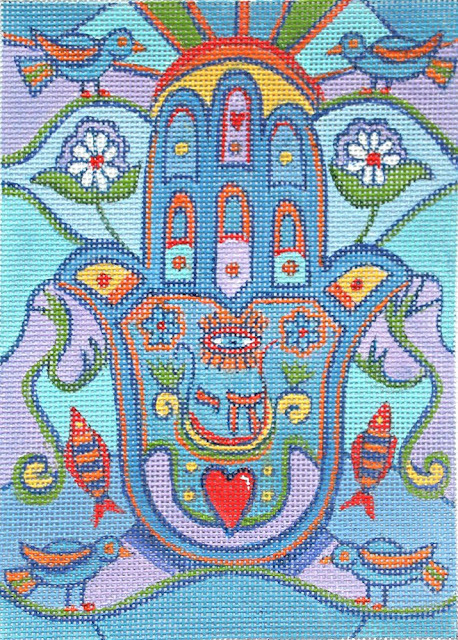 Marcia's Hamsa is also particularly pretty and the finished design measures 5x7" so it'd make a fantastic piece to appliqué onto the back of a denim jacket or even the front of a bag. The Eye of Providence or the all-seeing eye of God watching over humanity is a Christian motif. Usually it is surrounded by rays of light and enclosed by a triangle to symbolise the Christian trinity. 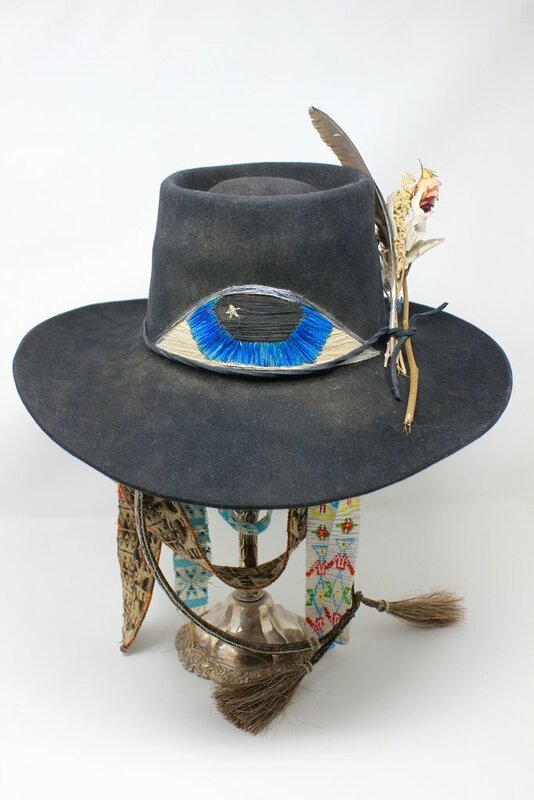 Honeywood Vintage evokes the All Seeing Eye by creating a more triangular shape to the embroidered eye motif on this fantastic vintage hawk hat! They also have a really wonderful coordinating hand stitched vest I keep eying up (sorry, couldn't resist). 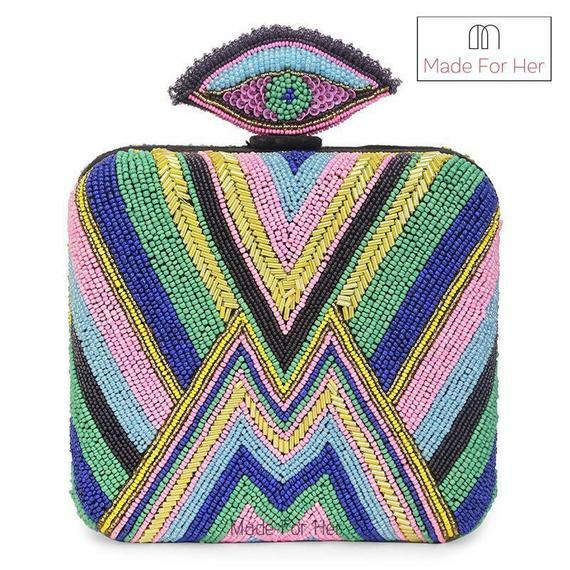 You can be sure to ward off the stink eye with this beaded clutch by Made For Her. Designed and made by Indian artisans, the patchwork style to the beadwork and the summery pastel hues make it the perfect cocktail clutch for this coming Spring/Summer and, it wouldn't look out of place with Libertine's offerings! 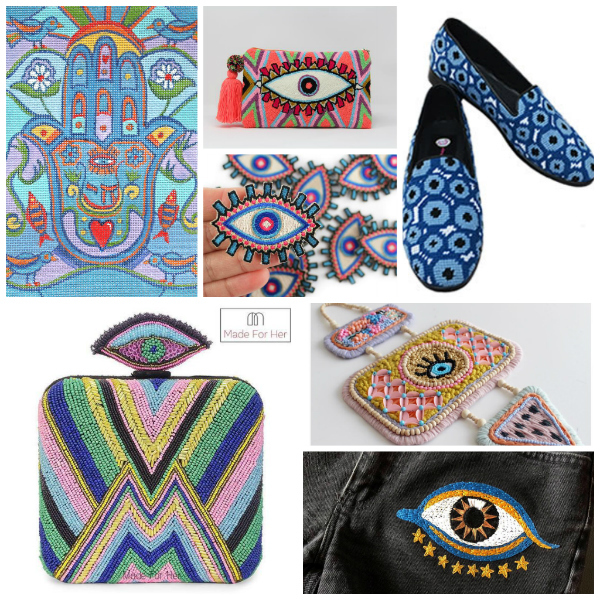 You could get the look by pairing this with some brightly coloured striped leggings and putting your sewing skills to good use by embellishing an oversized jumper with an evil eye made up of sequins, beads and hand embroidery. 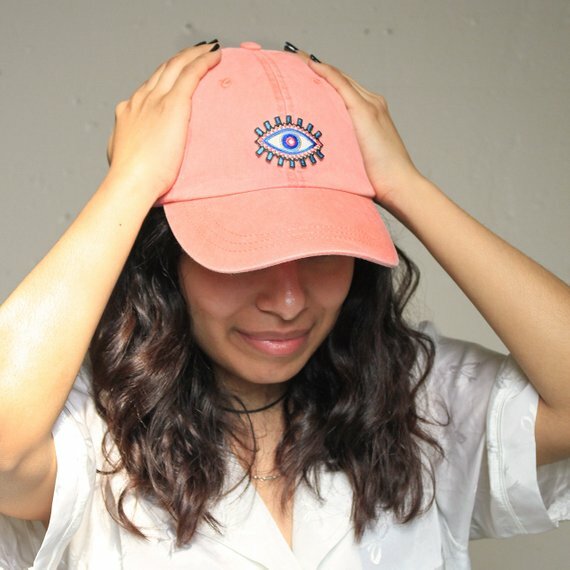 Sometimes it's hard to keep your eye on the ball, in times like these Wildflower and Company's embroidered evil eye baseball cap will help you out. In Hinduism the third eye is said to be in the middle of the forehead and it is believed that we all have a third eye, but to harness the power of its sight first we must awaken it. Once awake, the third eye is thought to look to the future, giving those who have opened theirs a stronger connection with intuition and a better ability to communicate with the world. If a more traditional wall hanging is more your style, I spotted this one over on Hello Tangle's grid. 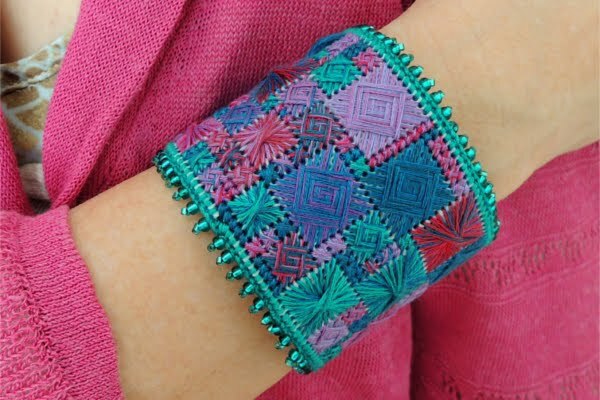 I adore all of the colour and texture in this bead and embroidered talisman. It's an exciting piece that not only looks beautiful but has beautiful intentions, warding off any bad spirits from your space. It's a good thing to wear your heart on your sleeve but how about your eye on your thigh? 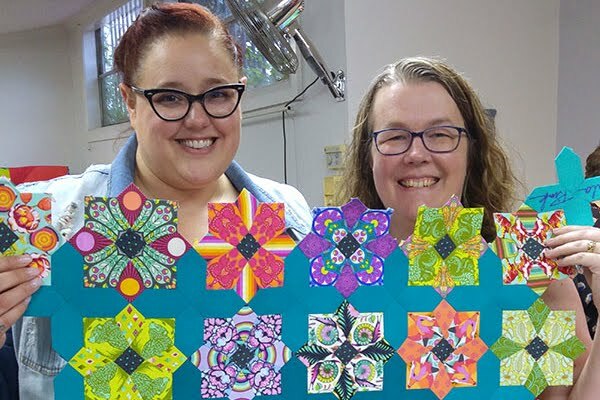 Now you can with this fun embroidery kit by Thread Honey. I think it's good for us all to be a bit starry eyed every now and then and this design would definitely make me smile when I saw it. 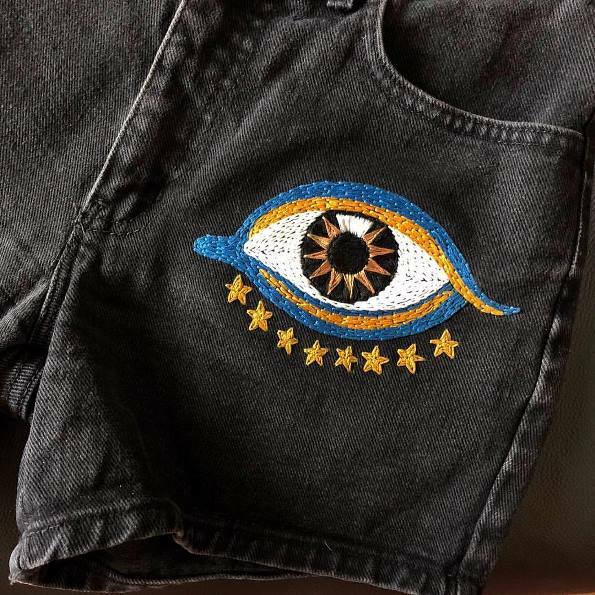 In Taoism, the third eye is thought to be situated between the eyebrows and students are encouraged to focus on this point to tune into the vibration of the universe... with these shorts you'll tune into the right streetwear vibration, if nothing else. Last up is this punch needle clutch from A Mordel Sur Shop. This is handmade by artisans in the highlands between Columbia and Venezuela and it's easy to see the South American influences in this bold and beautiful design. I haven't tried a punch needle yet but I love the texture it creates and this piece looks positively huggable. As I was researching this article I couldn't help wonder if the rise of the eye in popular culture points to the current atmosphere out there, that maybe we're all feeling the strain of modern life and the need for a little extra protection in this world? What do you think about eyes? 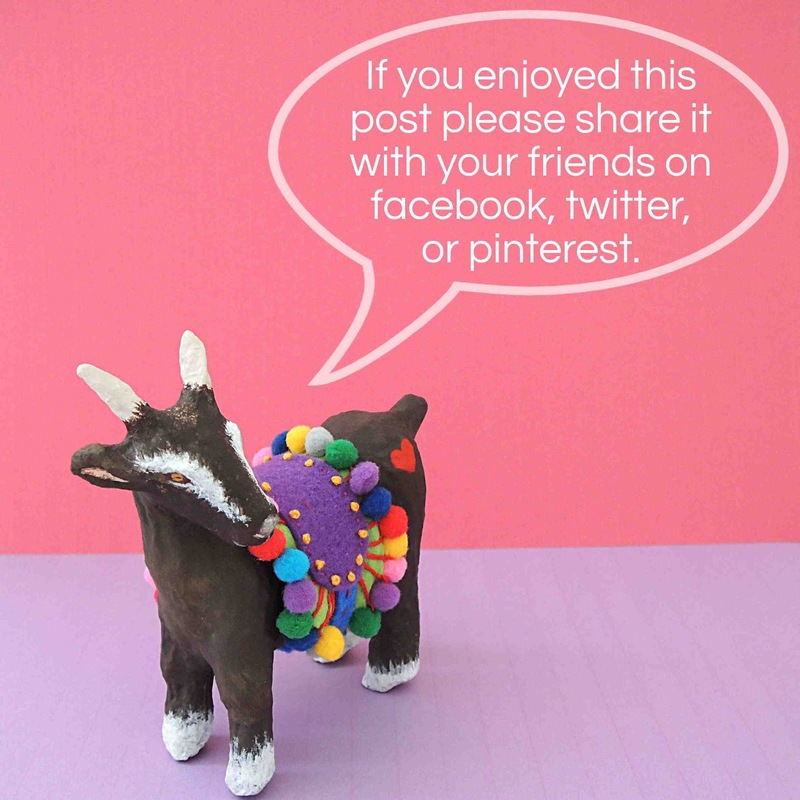 Will you be adding them to your needlepoint, cross stitch or embroidery designs? Or have you already incorporated eyes into your masterpieces? I love hearing from you, let me know in the comments. Also, if you've spotted another eye you love please do share it with us in the comments too, I'd love to see it. Did you enjoyed this post? Sign up to my newsletter to get more stitchy goodness delivered directly to your inbox. I can't promise it'll be weekly (it's usually roughly monthly) but I can promised it'll be a healthy dose of floss-filled fun. 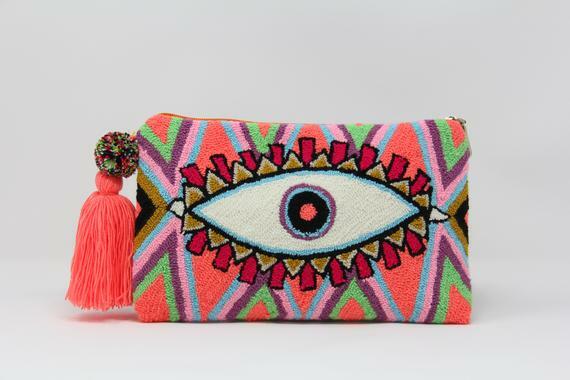 If this has inspired you to adorn yourself with handstitched eyes, I'd love to have a ganders. Say hello via email or tag me on Instagram using @bobbinandfred and #bobbinandfred. Wow! You have certainly discovered a wonderful selection of eye catching products. I particularly like Gigi Habids elegant shoes and Hellotangles wall hanging it would look super in my bedroom. I definitely would love to wear the Hawk Hat by Honeywood Vintage whilst dancing down the street in a pair of trousers covered in Eyes and Bananas. After reading this I have a much better understanding of the eye motif as like many other folk I also found it a bit creepy.